Will Green Cards Be Cut in Half? What could be more American? Enter a lottery, and win a chance at U.S. citizenship. Sure, the likelihood of getting the Diversity Immigrant Visa is slim — about 0.3 percent. But 14 million applicants try to win one of about 50,000 spots in the Green Card lottery each year. U.S. 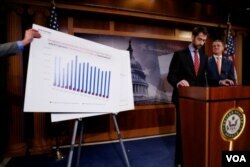 Senator Tom Cotton (R-AR) (red tie) and Senator David Perdue (R-GA) (orange tie) unveil legislation to curb legal immigration by halving the number of green card lottery winners, Feb. 7, 2017. As of early February, though, the diversity visa is once again facing an uncertain future. Republican Senators Tom Cotton of Arkansas and David Perdue of Georgia proposed a bill ending it, in addition to dramatically cutting the number of other legal immigrants and refugees allowed every year. A similar bill in the House of Representatives narrows the scope, only proposing to end the diversity visa. The 22-year-old visa lottery has been threatened before in legislation sponsored by Republicans and Democrats as recently as last year. But it never became law. Now with a Republican-controlled Congress and a president who has focused on immigration, the program is again at risk with the Reforming American Immigration for Strong Employment (RAISE) Act. "We are taking action to fix some of the shortcomings in our legal immigration system," Perdue said. "Returning to our historically normal levels of legal immigration will help improve the quality of American jobs and wages." Research has shown that the connection between jobs for Americans and immigration is tenuous. But there are other arguments against the lottery program. For one, the program is susceptible to fraud, both by and against applicants, as the U.S. General Accountability Office found a decade ago. The State Department improved the application to reduce the number of people who submit multiple applications in the same year, which is an automatic disqualification. Also, it alerts applicants that the lottery is free, and businesses charging a fee to submit lottery applications on applicants' behalf is illegal. Natalie Pereira queues up to go through immigration control at Maiquetia airport in Caracas in 2014 before her move to the U.S. with her family after winning the Green Card lottery. At its core, the diversity lottery was designed — as the name suggests — to diversify the immigrant stream to the U.S. from countries with lower immigration rates. When a country sends more than 50,000 immigrants to the U.S. in five years, they are excluded from the eligibility list. Natives of Bangladesh, Brazil, Canada, China, Colombia, Dominican Republic, El Salvador, Haiti, India, Jamaica, Mexico, Nigeria, Pakistan, the Philippines, Peru, South Korea, the United Kingdom (excepting Northern Ireland), and Vietnam were excluded from the most recent round of applications. For applicants who don’t have a family or employer sponsor in the U.S., or who aren’t refugees, the Green Card lottery is the only option. The lottery is a small portion of immigration to the U.S. every year, but larger than employment-based immigrant visas. In Fiscal Year 2015, the U.S. issued about 48,000 diversity visas out of 531,000 immigrant visas. Carolien Hardenbol, a diversity visa recipient from the Netherlands, moved to the U.S. in the late 1990s with her husband as new parents with advanced degrees and a sense of adventure. Uncertain they would be sponsored for permanent residency through work, they applied for the diversity lottery — and her husband won. "I envisioned this big hat where these envelopes were drawn,” she joked. What started as a volunteer position with Sanctuary for Families, a nonprofit organization in New York that provides legal services to victims of domestic violence and human trafficking, turned into a career for Hardenbol. After getting her legal permanent residency, she became co-director of the Immigration Intervention Project there. "Without diversity there would be no United States of America," says Hardenbol. Do fewer immigrants mean more jobs for Americans? The bill’s announcement follows a series of executive orders by President Donald Trump targeting immigrants, which have been met with lawsuits and protests. It also reflects the policy suggestions of some groups who want to restrict immigration. Reducing or ending the diversity visa has been a platform for groups who want reduce immigration to the U.S. The RAISE Act calls for cuts in family preference visas, refugee admissions, and the diversity lottery, while only adding a new W visa, to allow the foreign-born parents of adult U.S. citizens to visit for renewable five-year periods, without a path to citizenship or work approval. Some immigration supporters say the 50,000 visas could be better used. Florida-based immigration attorney John Gihon supports ending the diversity lottery, but only in favor of making more family visas available and creating a different opportunity for highly trained immigrants. “People with degrees in STEM subjects, medicine, nursing, etc, that we know will provide them with an opportunity to find work and contribute to the country should not be denied the green cards simply because there is currently no employer to sponsor them and give them a job,” says Gihon. Tekleab Elos Hailu applied a few times before winning the lottery. The father of three is a native of Eritrea; his wife is Ethiopian. They applied for the lottery while he was on a graduate scholarship in the United Kingdom, following a conflict between their home countries in the late 1990s. His first job in the U.S. was working security at a rental car company, though he eventually returned to academia, researching the experiences of fellow diversity lottery recipients and finishing his doctorate. He now works at a community college in Colorado. Because of the education or work experience required by the lottery, and the needs to be able to apply - like access to the internet and the funds to pay for the eventual green card fees, health screening, and travel - he believes diversity immigrants generally come from relatively well-off positions in their home countries, and as such are a net positive for the U.S. The RAISE Act has been referred to the Senate Judiciary Committee for review. Follow legislative actions on S. 354 here here and H.R.1178 - SAFE for America Act here. This story was first reported in VOANews.com. Do you have or want a Green Card? Please leave a comment here, and visit us on Facebook, Twitter, Instagram and LinkedIn, thanks!